A pollen and propolis mixture, constitutes a great nutritional extra - bees avidly seek out pollen to refresh their energy levels and replace their cellular content of calcium and iron. Stressful lifestyles and hectic demands on our time can take its toll. See Review section for nutritional info on pollen. Isn't it time you tried it! Bee surprised! 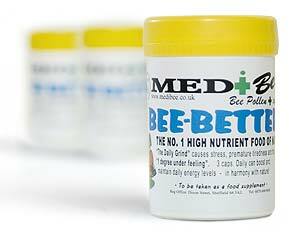 A pot of 60 Bee-Better Capsules will give you 2 – 3 weeks supply.